Premiered by soprano Barbara Hannigan [with the Berlin Philharmonic] and conductor Andris Nelsons in 2013. 'Let me tell you', winner of the 2016 Gawemeyer Award, is a setting of a libretto by Paul Griffiths. The work is based on Griffiths� 2008 novel of the same name, using the limited vocabulary which Shakespeare afforded Ophelia to create a more complex idea of the character. Comprising seven poems, the work is divided into three parts devoted to Ophelia�s past, present and future. 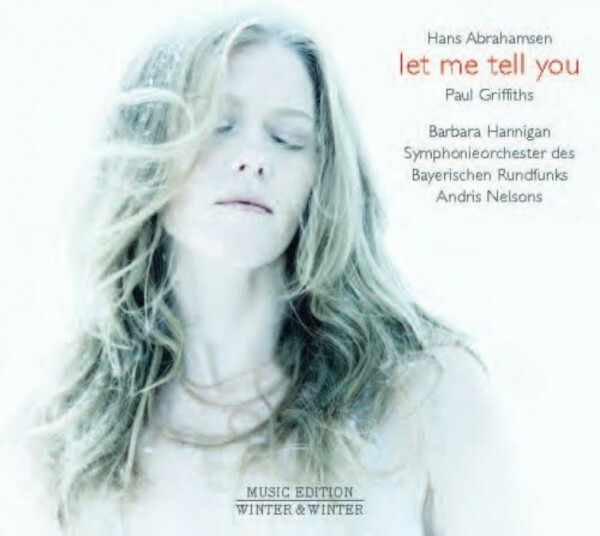 Danish composer Hans Abrahamsen was smitten by the idea of scoring Paul Griffiths� novella 'Let me tell you'. Barbara Hannigan, asked to sing at a surprise party for the writer and critic, dared to suggest a commission to the Berlin Philharmonic. Before she knew it, they had accepted. While many world premieres fall into oblivion, she has ensured subsequent performances with the Gothenburg Symphony, Rotterdam Philharmonic and the City of Birmingham Symphony this season. Other orchestras have plans to programme the work further down the line. The soprano, who has sung some 80 premieres, feels such a strong sense of responsibility that she compares the piece to a baby: "Don�t drop it", she wants to say, "keep it clothed and nourished". This is the second time that a musical setting of a text by Paul Griffiths has won the Grawemeyer (Tan Dun's Marco Polo won in 1998). The piece also won the 2014 Royal Philharmonic Society award for large-scale composition, which described it as "a work of exquisite beauty whose ravishing surface belies a meticulously imagined and innovative score". Abrahamsen�s other accolades include the Carl Nielsen Prize (1989) and the Wilhelm Hansen Composer Prize (1998). Hannigan has revealed just how involved she was at the early stages of the composition process: this being the composer�s first sung work, she [Hannigan] gave him a four-hour session in vocal music from Renaissance to 12-tone. "I think that�s why the writing doesn�t feel like modern music to me", she says. "I feel like it has always been there. Even though the intervals and rhythms might be difficult, the lyricism has a timeless quality".